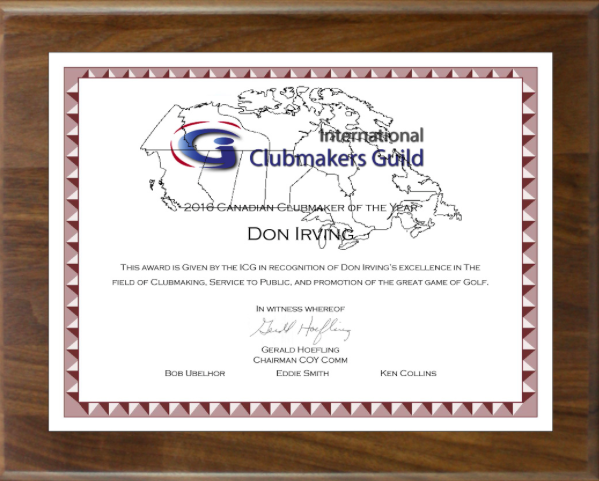 ICG Certified member Don Irving is the ICG 2016 Canadian Clubmaker of the Year. Don Irving writes about Artisan Golf. "My wife and I opened Artisan Golf in 1999 from our home. By January 2003 the business had grown enough that we moved to a retail location. The shop comprises 1500 square feet. We have a showroom, a fitting area, where we use Trackman Technology, and an upper level for club making and repairs. We are open Tuesday to Friday from 9:30 to 5:30 and Saturdays from 9 to Noon. In our fitting area, we have an extensive line of heads and shafts, using the Faz-fit System, We also use a projector so that there is the option of showing customers their ball flight, etc. We mainly feature the fine products offered by KZG , Miura, Accra and KBS. Our business has steadily grown since we opened. At this point the majority of our business comes from referrals. We have many loyal customers. We mainly promote our business through advertising in a local Golf Magazine called Flagstick. We also provide a monthly column on some aspect of club fitting or equipment. We attract customers from a wide area -- Montreal, Toronto, Kingston, Cornwall, etc. We have also had customers from as far afield as France, Australia and Nigeria, to name a few. They learn of our business through the Internet and make a point of visiting us for their club needs when they are in Ottawa. We have an excellent Website and are often found through a Web Search."